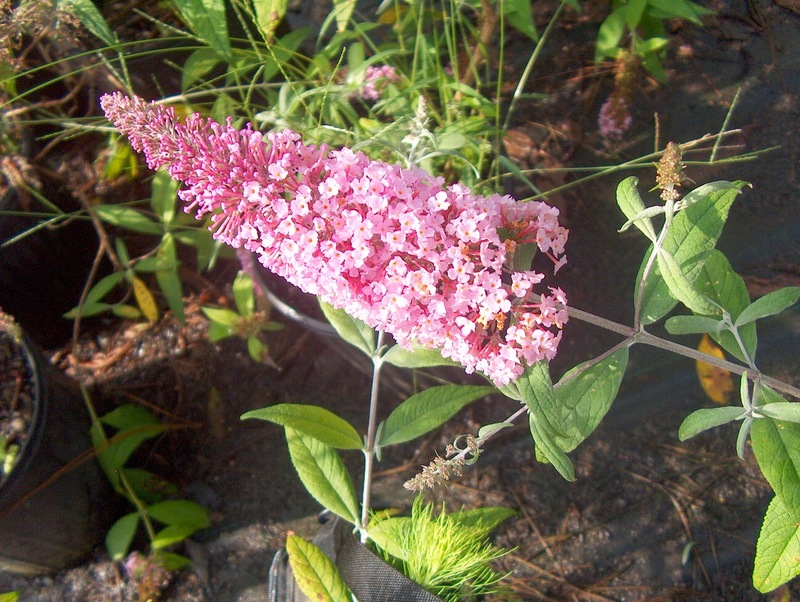 We've touched upon the importance of milkweeds in the butterfly garden -- they being the only host plants for Monarchs -- and are good nectar sources for butterflies in general. We'll get back to them in subsequent posts, but let's digress a bit for now and get acquainted with other potential butterfly plants for our own gardens. 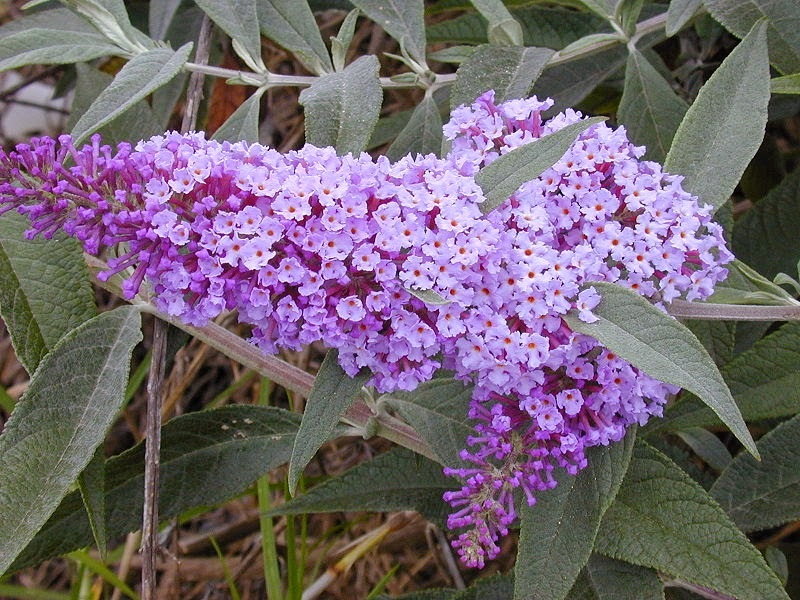 We'll start off with the king of butterfly nectar plants, Butterfly Bush, also known as Buddleia. 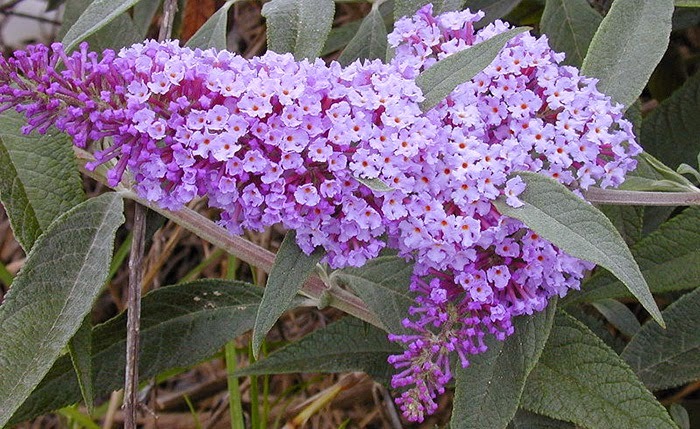 Typical Buddleia davidii bloom, or inflorescence. At times mistaken for lilac. 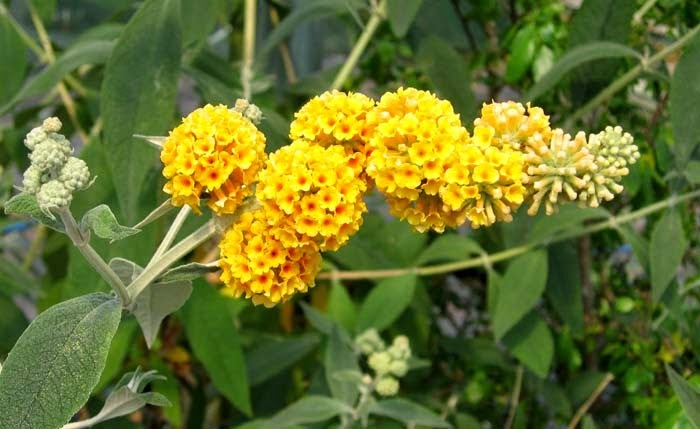 If a person were to place only one butterfly nectar plant in their yard, the highly recommended Buddleia would be the premier choice hands down. Those of you who frequent Alta Laguna Park in Laguna Beach may be familiar with this plant, as there are quite a few of them growing around the irrigation control panel and small adjacent lawn near the park entrance. During butterfly season, these bushes can be loaded with various butterfly species irresistibly attracted to the sweet scent of their blooms. I prefer to use genus species when referring to plants, as common names can be confusing. 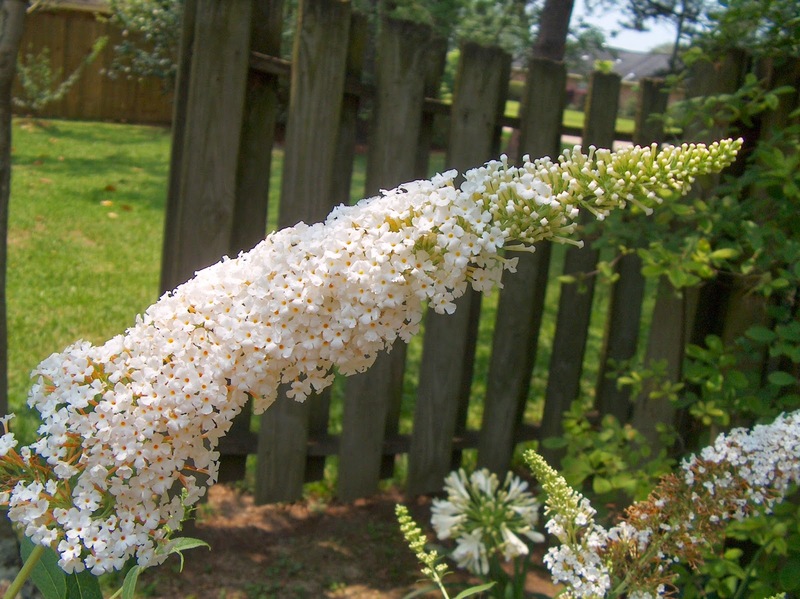 There are several other non related plants with the same common name, "Butterfly Bush". Scientific names can also be perplexing at times when their taxonomy changes for who knows whatever reasons. At times, it seems these name changes may be the result of taxonomists attempting to maintain job security within the hallowed halls of centers for higher learning. 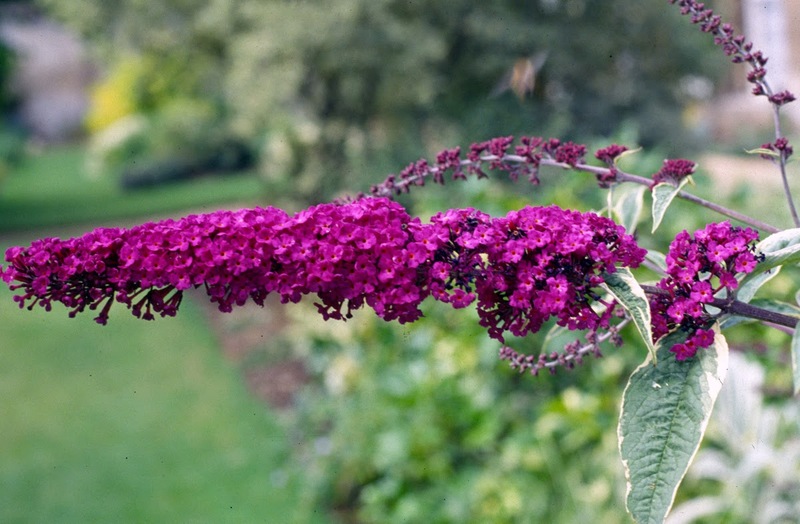 Buddleia, also spelled Buddleja, the "j" pronounced as "y", has become more popular in gardens as of late. This increased interest has resulted in an influx of new cultivars, ranging from new flower colors to a greater selection of growth heights. 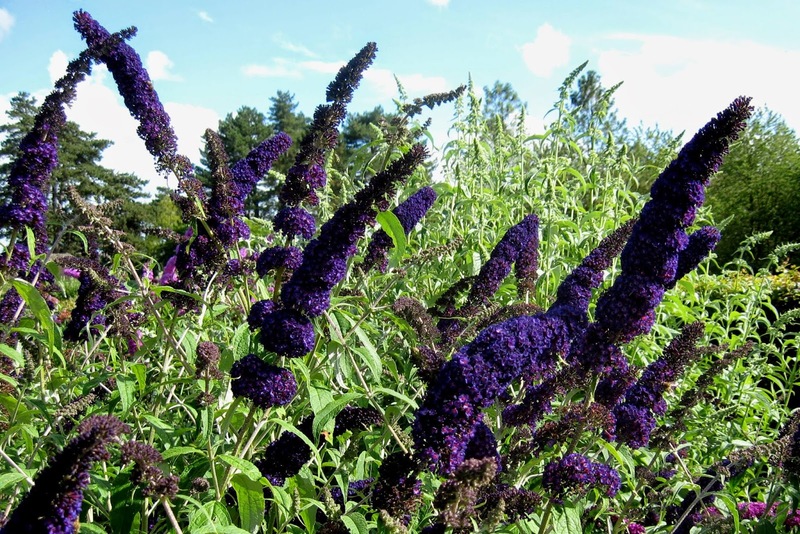 Buddleia flowers come in various colors. 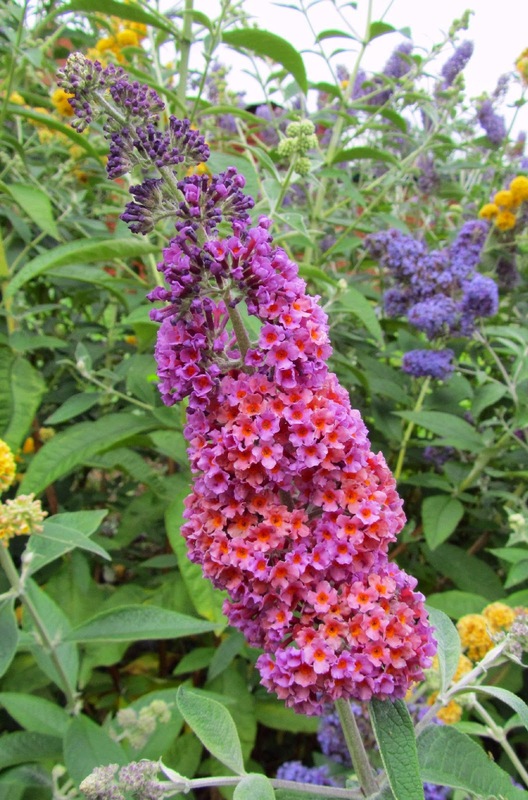 Standard Buddleias tend to grow over eight feet tall. Due to its increased popularity in the landscape, horticulturists have been very busy hybridizing and producing selections that are better suited for many of today's smaller yards. The nursery industry is even beginning to offer diminutive 1-2 ft. round varieties, perfect for edgings, planting in masses, or potting up in smallish containers. The Container Butterfly Garden is home to the semi-dwarf variety, 'Nanho Blue'. 'Nanho Blue' is a fairly compact grower to about 4-5 ft. tall and is growing well in a medium sized pot. Whatever butterfly species stray into the garden, they always stop by the buddleia and linger, sipping the abundant nectar offered by its blooms. Many of the larger nurseries now carry dwarf and semi-dwarf varieties along with the tried and true standard ones. The Green Thumb Nursery close to me has an excellent selection of various Buddleias. If interested, check with your local nursery about special ordering these plants if they don't regularly stock them. 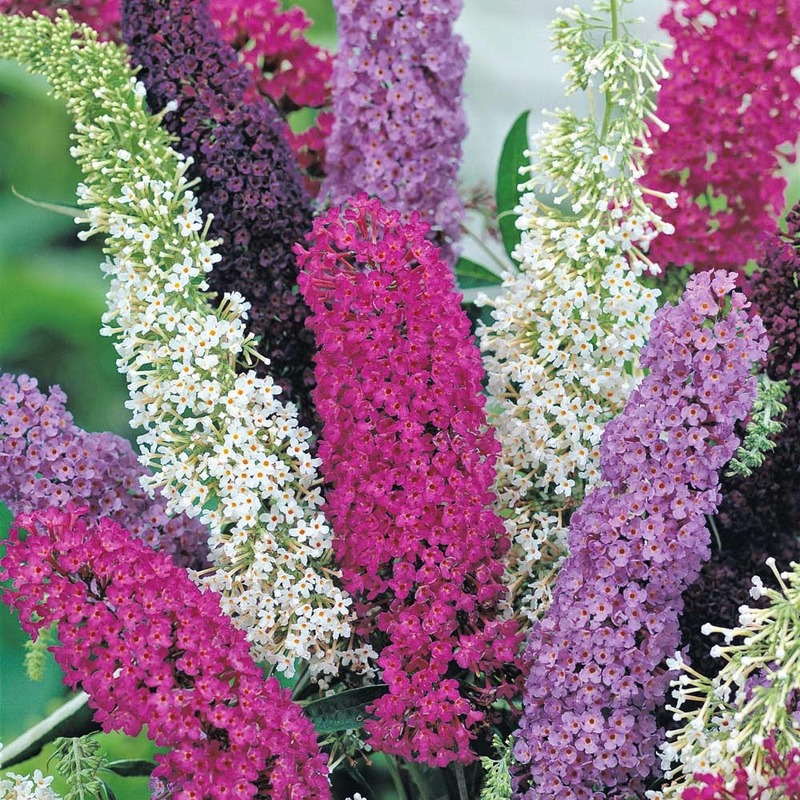 With today's extended selection, one is pretty much assured of finding a suitable Buddleia variety that is "just right" for that one spot or for a particular container. ...all the way to an extremely dusky shade in B. davidii, 'Dark Knight'. Reading glowing reports of 'Dark Knight' as being a particularly magnetic butterfly plant, in the past role of Parks Gardener for Alta Laguna Park, I planted several of them in the park not more than fifty feet from the generics growing by the irrigation control panel. There is (or was) 'Harlequin' growing in the Alta Laguna Park Butterfly Garden whose blooms are/were as deep, rich, and florescent as shown in the photo above. Truly, a remarkable color. It's also a variegated variety in which the foliage and color of the blooms compliment each other admirably. with B. weyeriana, resulting in this particularly beautiful inflorescence. As one can see, 'Bicolor' is a wonderful blend of both parents, taking on the best bloom qualities of each. 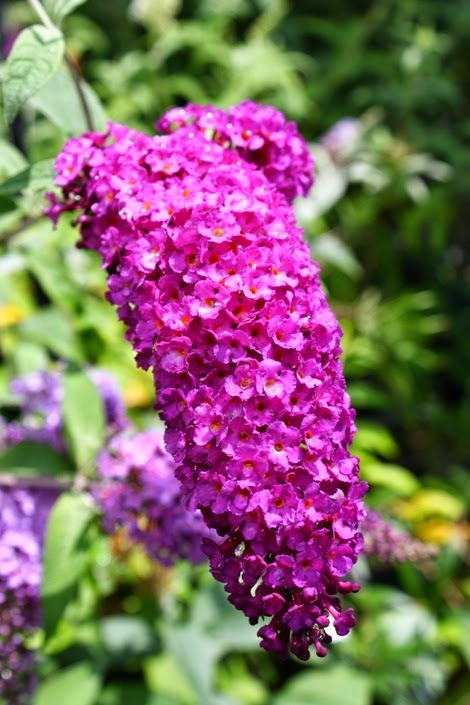 Buddleia is one of those easy care plants that once planted and settled in, pretty much takes care of itself. Average watering is all that's needed, and food requirements aren't demanding. For more and bigger, better blooms, a good feeding or two with a balanced fertilizer during growing season is appreciated. Cutting off spent blooms will help prolong bloom time. Some of the newer, more compact varieties are sterile, so deadheading isn't so important except for looks. To deadhead a plant is to cut off spent blooms before they go to seed. Those at Alta I let go to seed, and over the course of years I transplanted quite a few seedlings around the park and gave others away to interested park goers. Early winter pruning is recommended, although not absolutely necessary. A yearly pruning does encourage more and higher quality blooms the following years, and makes for a less rangy, fuller plant. Pruning a consistently maintained mature Buddleia takes only a matter of minutes: easy peasy as the saying goes. 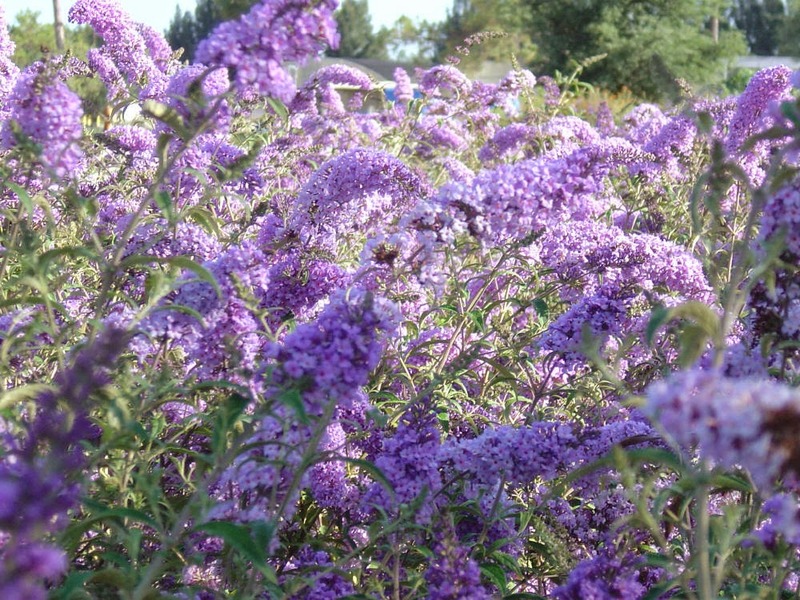 For serious butterfly garden gardeners, I would highly recommend including a Butterfly Bush in your plant palette. Once you see how attractive they are to your butterflies, you will be amazed at how many more of them come visit and linger in your garden.